And now for two presidents with terrible reputations that are probably a bit better than you think they were: Ulysses S. Grant and Richard Nixon. You name it, and someone robbed it under Grant. The most infamous was a railroad/investment scheme called the Credit Mobilier, but there were major frauds involving the U.S. Post Office (the star route scandal), the Whiskey Ring, a dispute over Congressional salaries, graft in the Customs service, kickbacks at Western trading posts, nepotism and ineptitude in the U.S. Civil Service, crooked government contracts, and corruption in both the Interior Department and the Attorney General's Office. The Credit Mobilier was the most publicized scandal, but the Gold Ring was more serious—the failure of Grant financial overseers to reign in speculators, James Fiske, Jay Gould, and Jay Cooke precipitated the Panic of 1873, which led the U.S. into a deep recession that lasted into 1879. Depending upon which scholars you read, this was either the second or third worst depression in American history. Nixon, of course, will be forever known for Watergate that led to his resignation. 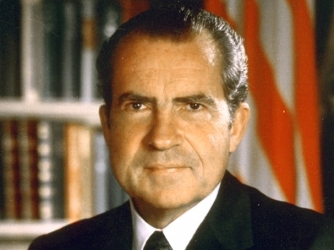 There is no sugar coating Watergate; it was a serious assault on the U.S. Constitution and would have certainly led to deserved impeachment and removal from office, had Nixon not resigned. It is not discussed nearly enough, but the break-in of Daniel Ellsberg's psychiatrist's office was a veritable dry-run for Watergate, complete with several of the same culpable individuals. Both were horribly bungled, with Ellsberg escaping all possible prosecution for his release of the Pentagon Papers—an exposé of government lies on Vietnam that didn't even involve the Nixon administration! A third scandal touching Nixon was the resignation of Vice President Spiro Agnew pursuant to dirty deeds done as governor of Maryland. Although it wasn't indictable, Nixon's infamous enemies' list–which included everyone from the New York Times staff to Barbara Streisand–exacerbated social tensions at a time in which they were already at fever pitch. Neither man was a good steward of the economy. Grant oversaw, with little influence, the Panic of 1873. This event had a profound effect on American society in another way­: it caused an already weary Northern public to ignore Reconstruction, which hastened its demise on Southern terms. Conservatives don't like to hear this, but Nixon instituted wage and price controls in a futile effort to stem inflation related to the first OPEC oil boycott in 1973. Although many Americans blame Gerald Ford and Jimmy Carter for 1970s stagflation, each inherited it from Nixon, who was president when the post-World War II economic expansion ended. Both men wrestled with personal demons. Until recently, Grant was viewed as a clinical alcoholic. Doubt has been cast upon this diagnosis, but there is no doubt that Grant drank heavily. How much of this clouded his judgment is hard to say, but those wishing to argue that military officers make poor civilian leaders find ammunition with Grant. He trusted his appointees to carry out orders and was furious when scandals ensued. He wanted to serve a third term and—as he later told Mark Twain, who helped him write his memoirs–blamed subordinates for making a third term impossible. Grant might also be an example of the Peter Principle, a man promoted to his level of incompetence. Many in the mental health field speculate that Nixon was clinically paranoid. The enemies' list suggests this, as did Nixon's penchant for speaking of himself in the third person, his hidden taping of White House conversations, his own heavy drinking, the rapidity with which Nixon flattered and then slandered those that disagreed with him, and the fact that he had few confidants and even fewer friends. Watergate could also be viewed in this light–it was completely unnecessary and only a deeply suspicious person could have thought the outcome of the 1972 election in doubt. Nixon was our angriest president and probably the loneliest. Now for the controversial part: Personal failings aside, both men have surprisingly progressive achievements on their vitae. Grant soothed a political climate roiled by the impeachment and near-removal of Andrew Johnson. Unlike Johnson, Grant supported Reconstruction efforts and was not in favor of appeasing the South. He personally lobbied for the 15th Amendment, which declared black men citizens and defended their right to vote. He insisted that federal laws be enforced and nearly destroyed every remnant of the Ku Klux Klan and other such hate groups, until two Supreme Court rulings tied his hands (the Slaughter House cases and Cruickshank for those keeping score). Even then, he sent troops to Louisiana in the wake of the horrific 1873 Colfax Massacre. Grant was equally good on Indian affairs. He urged greater sensitivity on the part of whites and appointed Seneca Ely Parker as his Commissioner of Indian Affairs, the first native to head the agency. Grant ruffled feathers (pun intended) when he expressed his view that Custer got what he deserved at Little Big Horn! 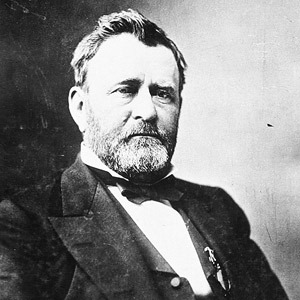 The Grant scandals came from his administrative ineptitude and never touched him personally. Nixon, as we subsequently learned, was up to his eyeteeth in the scandals touching his administration. We might never know for certain if he planned them, but he simply ran roughshod over the Constitution. Grant tried to improve race relations, whereas Nixon mostly saw black power movements as revolutionary enemies nationally and personally. He used the idea of the silent majority to position whites, blue-collar workers, and older immigrant groups as threatened by race radicals. The same strategy was used against campus groups; Nixon was president during divisive events such as the hardhat riots, Kent State, and Jackson State. Grant didn't venture into the foreign relations realm very much. He did get sucked into an aborted attempt to annex the Dominican Republic, and sent peacekeeping troops to Cuba in 1873 that somehow managed to avoid embroiling the US in anything serious, but that's about it. Nixon is, of course, best known for establishing US relations with China, an act that ultimately set the table for a truly global economy. He also signed an anti-ballistic missile treaty with the Soviet Union, a major thaw in the Cold War. The rest of Nixon's foreign policy falls into the divisiveness that marked his domestic policies. He fanned tension between the U.S. and Cuba, which many viewed as a cynical attempt to curry Republican favor with the Cuban-American community. His administration stands accused of green-lighting a CIA role in the overthrow of Allende in Chile, which ushered in authoritarian rule there. The U.S. actively sided with Israel during the 1973 Yom Kippur War. This was popular at the time and many scholars continue to support it. It was also, however, cited as a major cause of the OPEC oil boycott that weakened the U.S. economy. Nixon's secret plan to end the Vietnam War is now viewed as a deeply cynical campaign ploy. Nixon went hard at Ellsberg because his own administration was involved in fabricating its own fictions, such as bombing Cambodia, extending the war into Laos, and seeking to cover up US operations at a time in which the US was officially winding down its involvement. Some of the largest (and most vociferous, even riotous) anti-war protests took place under Nixon. Although many American equate Vietnam with Lyndon Johnson, 36.4% of all American troop deaths occurred under Nixon. The peace treaty he ultimately singed in 1973 was distressingly similar to that which he could have signed in 1969. The Nobel Peace Prizes awarded to Henry Kissinger and Vietnam's Le Duc Tho now invites contempt. The communist North easily defeated the South in 1973, and both Cambodia and Laos fell to communist governments. Nixon's Vietnam policy was, by all objective standards, a disaster. How does one rate these presidents: by their accomplishments, or by their failures; by their intentions, or by the demons that consumed them? Scholars give low ratings to each: #33 for Nixon and #36 for Grant. I would certainly rate Grant higher than Nixon, and it must be said that some of his bad press comes from Southern racists who opposed Grant's progressive views on Reconstruction. The scandals, though, mean he's unlikely to rise very much. I can imagine a mild uptick for each, though Nixon isn't going much higher until those who remember him are gone. His was such a divisive presidency that a significant forgive-and-forget rethink is unlikely. Welcome to the Accidental President portion of this series. 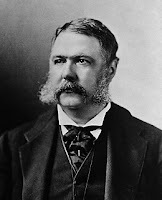 Chester Arthur (1881-85) was a more important president than Gerald R. Ford, but the two need to be considered in tandem because they might both have been illegal presidents. I lump them also because they are relatively forgotten. I'd wager a lot of people don't even know we had a president named Chester Arthur, and I suspect a lot of people asked to name the presidents from Kennedy to the president would overlook Ford. Both men calmed the public after a period of national crisis­–Arthur after the assassination of James Garfield, and Ford after the long national nightmare of Watergate. Neither man had great success in foreign relations. Although Arthur did play a role in ending a war consuming Chile, Bolivia, and Peru, he also ended a trade treaty with Hawaii that later led to violations of Hawaiian sovereignty. 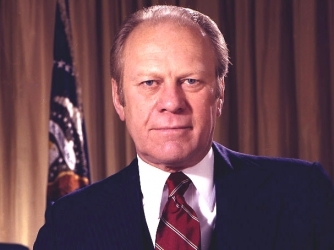 Ford was president when Vietnam fell to the communist North in 1975, and endured the humiliation of communist Cambodia seizing a U.S. ship, the Mayaguez. Both men made decent appointments to the Supreme Court, two solid men in Arthur's case and John Paul Stevens in Ford's. Both favored civil rights, but failed to do much to advance them, with Arthur making several very bad decisions. He signed into the law the Chinese Exclusion Act that prevented Chinese immigrants from entering the USA until World War II. Arthur also favored giving Native Americans individual allotments of land, a policy that led—in 1887, after his presidency–to the Dawes Act, which led to the loss of millions of acres on Indian land. The Pine Ridge shootout occurred under Ford's watch and he didn't do much to deescalate tensions with African Americans either. The Boston busing crisis occurred during Ford's presidency, as did several major race riots. Both Arthur and Ford are remembered (if at all) for one important thing: Arthur for reforming the civil service, and Ford for his pardon of Richard Nixon. Evidence suggests that neither man really cherished being POTUS. Ford campaigned in such a lackluster fashion that he nearly lost the 1976 GOP nomination to Ronald Reagan, and proceeded to lose to Democrat Jimmy Carter, a relative unknown on the national scene. Ford was so uninspiring that unofficial slogans were remembered more than his official ones. Among the former were "Stay Bored with Ford" and "Re-elect Betty's Husband," a reference to Ford's wife, whose battles with alcoholism garnered more PR than Mr. Ford could muster. Chester Arthur had no stomach for the White House, literally and figuratively–a combination of ill health and disinterest led Arthur to eschew a run on his own behalf in 1886. Arthur was, by far, the more impressive of the two men. He is often cited as a man who rose to the level of the office he held. A small bit of background: After the collapse of Reconstruction, the Republican Party mired itself in a nasty factional dispute over patronage. So-called Stalwarts led by New York's Roscoe Conkling were content to fill government jobs through the old "spoils system" in which winning parties got to dole out patronage to friends, family members, and political allies; Half-Breeds led by James Blaine of Maine favored reforming the system. Prior to becoming president, Arthur was such a notorious and corrupt hack in Conkling's New York machine that President Hayes fired him from his post at New York City's Custom House. Arthur was an unlikely reformer, but he appears to have undergone a political conversion experience when President Garfield was murdered by frustrated office-seeker Charles Guiteau. Arthur angered his Stalwart friends by placing his signature upon the Pendleton Act, a bill that set up the modern civil service merit system entrance exams. There is nothing in Ford's record that matches this. Arthur also balanced each of his budgets, whereas Ford ran big deficits and saw the outbreak of runaway inflation. 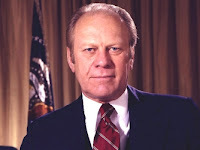 Ford, who was in office for the second OPEC oil boycott, was considered a poor manager of the economy, and his W.I.N. program (Whip Inflation Now) was ridiculed at the time and was subsequently viewed as wholly ineffective. Aside from the Nixon pardon, Ford's 18 months in office offered little of note, other than dodging two assassination attempts, including one by a former Manson family associate. His major contribution was to the field of comedy—his penchant for clumsiness sparked the career of Chevy Chase, a relatively unknown Saturday Night Live cast member who parlayed imitating Ford's pratfalls into TV fame–not exactly the sort of presidential legacy that sparks a wave of monument building! Oddly, Ford currently ranks 26 and Arthur 28. There is no reason to rank Ford this high, and Arthur deserves a slightly better rating. Look for readjustment on both ends—maybe 30 for Ford and as high as 23-25 for Arthur, who deserves a higher rank for his facial hair alone.